LEMAN-INSTRUMENTS designed the FID STATION 50RC product line of High Purity Hydrogen & Zero Air generators with compressor to supply independently all gases necessary to FID detector, close to the consumer in elegant 19” casing with full colour display and touchpad. Based on the field-proven Solid Polymer Electrolyte (PEM) cell technology, pure Hydrogen is produced at low pressure from electricity and high quality distilled water. It is available 24/7 with constant purity >99.999%. Output pressure is regulated electronically and could be set from 0.5 to 7 bar. This process can be started on demand and does not require any caustic solution. Based on the Pressure Swing Adsorption (PSA) technology, compressed Air is first dried and filtered from pollutant gases; and then passes throughout a hot catalytic chamber to remove HC, CO, and CH4. Output pressure is regulated from 0.5 to 5 bar. Each instrument is equipped with high performance communication interfaces USB and Ethernet (Opt) to create a very flexible gas network with local or central control. Due to the software being focused on safety, automatic regulation and intuitive and up to date communications, the FIDSTATION 50RC is easy to install, reliable, safe and pleasant to operate. H2and Zero Air available 24/7 at constant purity. No contamination. Independent source of Hydrogen and Zero Air that does not require any piping and can be easily moved around the laboratory. Remote control from PC, smart phones and other portable devices. Low noise compressor < 55dB (A)). Reduction in operation costs. Return on investment within 15 months. AIR: from 0.5 to 5 bar (7 to 70 psig), adjustable by software. LEMAN-Instruments designed the GC STATION 60RC product line of High Purity Hydrogen, Nitrogen & Zero Air generators with compressor to independently supply all gases necessary for a FID detector and GC’s carrier in close proximity to the consumer and in an elegant 19” case, with full colour display and touchscreen. Based on the field proven Solid Polymer Electrolyte (PEM) cell technology, pure Hydrogen is produced at low pressure from electricity and high quality distilled water. It is available 24/7 with constant purity >99.9999%. Output pressure is regulated electronically and could be set from 0.5 to 7 bar. This process can be started on demand and does not require any caustic solution. Atmospheric is compressed is partially dried and filtered from HC, CO and CH4 passing throughout an hot catalytic chamber. A first Pressure Swing Adsorption (PSA) module is drying and filtering pollutant gases; a second Pressure Swing Adsorption (PSA) module extracts N2 from compressed AIR. Output pressure are regulated from 0.5 to 5 bar. H2, N2 and Zero Air available 24/7 at constant purity. No contamination. H2: from 0.5 to 7 bar (7 to 100 psig), adjustable by software. AIR & N2: from 0.5 to 5 bar (7 to 70 psig), adjustable by software. 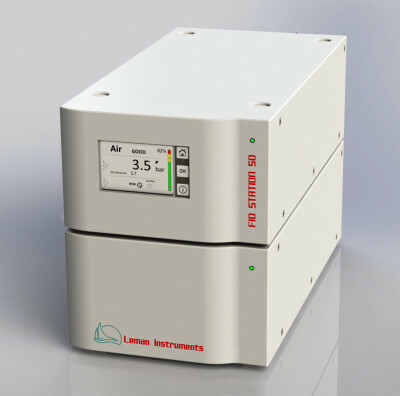 LEMAN-INSTRUMENTS designed the PID STATION 50LC product line of Ultra High Purity Nitrogen & Zero Air generators with compressor to supply independently N2 & AIR for GC-FID, carrier gas for GC, close to the consumer in an elegant casing with full colour display and touchscreen. The PID Station is composed of an Ultra High Purity Nitrogen generator, an Ultra Zero Air generator and an oil free piston AIR compressor. Compressed Air is first partially dried and then passes throughout a hot catalytic chamber to remove HC, CO and CH4. Each gas, N2 and AIR, is dried and purified or extracted by the Pressure Swing Adsorption (PSA) technology. N2 & AIR output pressures are regulated from 0.5 to 5.5 bar. Long life compressor with power economy function. N2: from 0.5 to 5.5 bar (7 to 80 psig), adjustable by software. AIR: from 0.5 to 5.5 bar (7 to 80 psig), adjustable by software. LEMAN-Instruments designed the AEROSTATION 20RC-CAT product line of Zero AIR Generator with on board compressor, to fit almost any type of application which needs independent supply of high purity AIR close to the consumer in an elegant 19” casing with full colour display and touchpad. Compressed Air is filtered throughout a hot catalytic chamber to remove CO, CH4 and HC. After the purification process, pressure is regulated by an external manual valve, between 0.5 and 5 bar. (7 to 70 psig). Models with outflows up to 20 L/min AIR are available. Each instrument is equipped with high performance communication interfaces (RS485, Ethernet) to create a very flexible gas network with local or central control. Due to the software being focused on safety, automatic regulation and intuitive and reliable communications, the AEROSTATION are easy to install, reliable, safe and pleasant to operate. 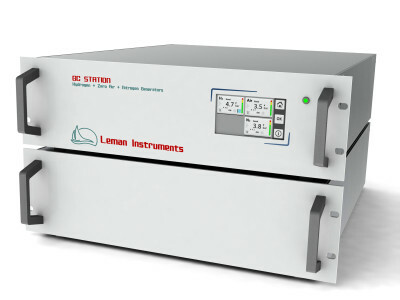 LEMAN-Instruments designed the HYDROSTATION product line of Non Maintenance Ultra High Purity Hydrogen generator to aliment an FID and GC, close to the consumer in an elegant 19” casing with full colour display and touchpad. Based on the field proven Solid Polymer Electrolyte (PEM) cell technology, pure Hydrogen is produced at low pressure from electricity and high quality distilled water. After production, H2 is dried and purified by an exclusive No Maintenance Double Column Purifier module (PSA). H2 is available 24/7 with constant purity >99.9999%. Output pressure is regulated electronically and could be set from 0.5 to 7 bar. This process can be started on demand and does not require any caustic solution. Models with outflows of 100, 160, 250 and 500 Nml/min H2 are available. Due to the software being focused on safety, automatic regulation and intuitive and reliable communications, the AEROSTATION 20RC-CAT are easy to install, reliable, safe and pleasant to operate. 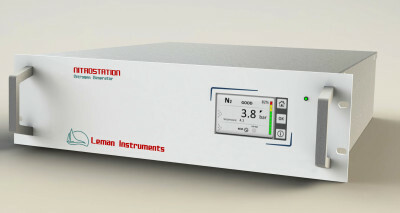 LEMAN-Instruments designed the NITROSTATION50RC product line of Ultra High Purity Nitrogen Generator with integrated Air compressor, to fit almost any type of application which needs independent supply of HC free pure Nitrogen close to the consumer in an elegant 19” casing with full colour display and touchpad. Compressed Air is first filtered from particulates down to 5μm and dried by a static dryer. Based on the field proven Pressure Swing Adsorption (PSA) technology, Nitrogen is extracted from a set of filters filled up with CMS. After the extracting process, N2 passes throughout a hot catalytic chamber to remove the last traces of organic compounds, is then stored in a buffer and filtered of remaining particulates down to 0.1μm; finally output pressure is regulated electronically to the set value, between 0.5 and 5 bar. Models with outflows of 100, 200, 500 and 1000 Nml/min N2 are available. Each instrument is equipped with high performance communication interfaces (USB, RS485, Ethernet, and WLAN) to create a very flexible gas network with local or central control. Due to the software being focused on safety, automatic regulation and reliable communications, the NITRO High Purity Nitrogen Generators modules are easy to install, reliable, safe and pleasant to operate. LEMAN-Instruments designed the Dilution Multipoint Calibration Station (MCSD) product line, to fit almost any type of application which needs high precision gas mixture based on diluting high concentration mixture with integrated Zero Air generator (option). Based on the two calibration curves of MFC1 and MFC2, as well as the pre-mixture composition, the integrated microcontroller adjusts the MFCs’ outflows to reach the expected final mixture. In order to aliment MFC1 with fresh gas, before calibration phases, a purge cycle is processed. The Carrier gas, Zero Air, is generated from external source or internally (optional). If it is generated internally, first AIR is compressed from ambient Air and then filtered from pollutants by a set of self-regenerative filters (PSA) and a catalysis oven (option). To monitor the pre-mixture internal cylinder pressure, a high pressure sensor is attached to it and the value is read and treated by the dilutor’s electronics. In case of low pressure and lack of alimenting gases, the internal controller alarms the host system. Each instrument is equipped with high performance communication interfaces (RS485, Ethernet) to create a very flexible gas network with local or central control. Due to the software being focused on safety, automatic regulation and intuitive and reliable communications, the Dilution Multipoint Calibration Station (MCSD) are easy to install, reliable, safe and pleasant to operate. 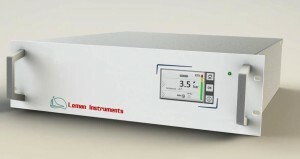 LEMAN-Instruments designed the modular Multipoint Permeation Calibrator (MPC) product line, to fit almost any type of application which needs high precision gas mixture based on permeation tubes. In order to keep in equilibrium the permeation tube, the oven’s temperature is regulated at +/-0.05°C and is under a constant flow (50 to 80 ml/min) of standard quality (4.5) carrier gas made by MFC1. Between calibrations, the high concentration and low flow mixture is directed through a 3/2 valve (V2) to the purge outlet. When the calibration is started, MFC1 is then alimented by high purity carrier gas, V1 switched to CO2 6.0; later V2 is also switched on and the high concentration mixture is injected in the carrier gas flow generated by MFC2. Based on the two calibration curves of MFC1 and MFC2, as well as the tube’s permeation rate, the integrated microcontroller adjusts the MFC2’outflow to reach the expected final mixture. In case of lack of carrier gas, eventual malfunctioning of the oven, and before the life time end of permeation tube, the internal controller alarms the host system. Each instrument is equipped with high performance communication interfaces (RS485, Ethernet, and WLAN) to create a very flexible gas network with local or central control. The Silent Oil free Air Compressor Unit, CAS1, is a plug-and play, ready to use AIR compressor unit, designed especially for laboratories and for alimenting AEROs and NITROs gas generators manufactured by LEMAN-INSTRUMENTS. 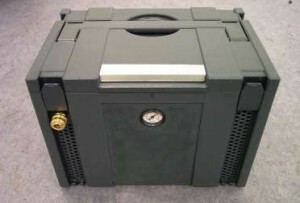 This small compressor unit is built into a ventilated and portable case with the dimensions of 400x335x320 mm. When the calibration is started, MFC1 is alimented by high purity carrier gas, V1 switched to CO2 6.0; later V2 is also switched on and the high concentration mixture is injected in the carrier gas flow generated by MFC2. Based on the two calibration curves of MFC1 and MFC2, as well as the tube’s permeation rate, the integrated microcontroller adjusts the MFC2’outflow to reach the expected final mixture. In case of lack of carrier gas, eventual malfunctioning of the oven and before the life time end of permeation tube, the internal controller alarms the host system. Each instrument is equipped with high performance communication interfaces (RS485, Ethernet, and WLAN) to create a very flexible gas network with local or central control. 100 % continuous operation up to 40 °C ambient temperature. Can be easily moved around the laboratory. No handling, No storage. No cylinder rental fee. Pressure switch. Start/Stop compressor on flow demand. LEMAN Instruments generators lines of Hydrogen, Nitrogen, air and zero air generators have been designed to fit most applications in the field of laboratory, air quality monitoring, special realisations and OEM. Each instrument is equipped with high performance communication interfaces allowing to realise very flexible gas networks with either local or central control. The control software handles all safety functions, the automatic pressure regulation functioning status and ensures reliable communications. Compliance monitoring systems often require automatic calibration check on a daily or weekly basis. In addition to the calibration checks a proper instrument calibration and linearity check must be conducted 6 monthly or yearly. To perform a linearity test for each gas and at five different concentrations it would be very expensive to have separate gas bottles for each test. It is also very time consuming to manoeuvre such a large quantity of bottles. A gas dilution calibrator makes the job much easier. These five reference materials can be obtained from different gas cylinders or can be prepared by means of a calibrated dilution system from one single gas concentration. So in essence, the CEMS & AQMS operator will only need to carry as many bottles that represent each of the gases. In most cases these cylinders are already kept on site and connected to the system as they are used for the daily (or weekly) calibration checks.